It is totally possible to live the delicious dream of an all vehicle turducken . They lost of course, but when I asked they said, “It was the best loss ever,” which isn’t too bad in the grand scheme of things. On the other hand if you would rather have crushing victories instead of memorable losses, then you’re probably going to want to play these instead. Let’s get started with a card that is full to bursting with options. Propeller Pioneer is a 2/1 flyer for 4 with Fabricate 1. Most of the time it’s a great 3/2 flyer for 4 which is a pretty good rate. But there are times when you want to keep a blocker back, and then you can leave a Servo token on defense. In either situation this is an aggro card with wings on it. Either you smash for 3, or you smash for 2 with insurance. Either way you’re in good shape. Another top pick was Aerial Responder, but that card is clearly awesome and it doesn’t need my help. Oh, and before I forget, Fumigate is real. That little rider about gaining a life for each creature you send to hell gives you back a bunch of the life lost while your opponent was attacking your empty board. 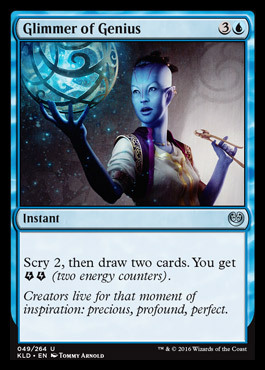 Glimmer of Genius is probably just one of the best cards in the set period, since it let’s you scry 2 and then draw 2 cards. It lets you churn through 10% of your limited deck looking for an answer at instant speed. Plus it makes energy, which might be really great in certain situations. But frankly, a 4 mana scry 2, draw 2 instant would be great already. If this doesn’t go into constructed decks I’m going to be confused. Another card for consideration (but a rare, so, no) is Insidious Will, or as I like to call it Cryptic Command Jr. Yes, it’s a 4 mana counterspell, but it’s stapled to a 4 mana Deflection and a 4 mana Fork. Honestly, if that isn’t a good enough excuse to run some countermagic, I can’t help you. There are a lot of things to like about Make Obsolete. It’s priced to move and it’s an instant. In many sets giving -1/-1 to your opponent’s guys is annoying not backbreaking, but Make Obsolete can win you the game on the spot. First of all, Servos are everywhere due to fabricate. Giving them all -1/-1 will clear out the ground game. But the real reason this card is so good is because it’s a cheap instant. It’s pretty easy to set up combat situations that can turn a defeat into a blowout by making their whole team a little smaller. Now instead of trading, you win, and you get to send all of their Servos to the scrapyard. It’s a little gross, but in a good way – like peanut butter ice cream. Another card that plays above what you would think is Aetherborn Marauder. 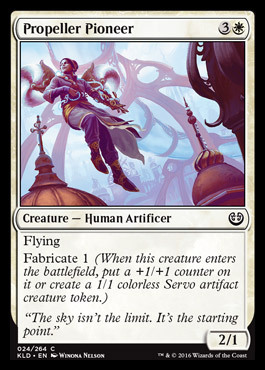 A 2/2 flying lifelinker for 4 is pretty good to start, but since +1/+1 counters are so ubiquitous in Kaladesh, he’s way more likely to end up as a 5/5 or better. Last I checked, we call that a bomb. Moving along. 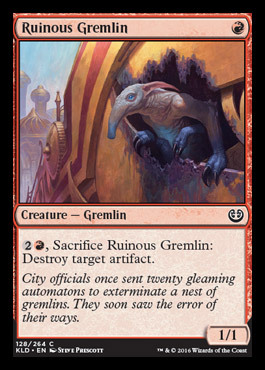 In most sets, Ruinous Gremlin would get cut. 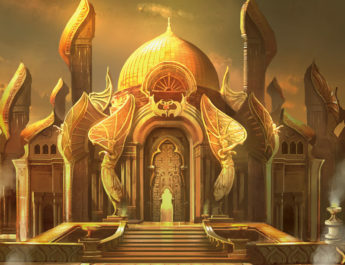 Kaladesh is not that set. I had second thoughts about running it until I made a couple of startling revelations. First, there aren’t a lot of good 1 drops in the set (except for Thriving Turtle). Second, being able to randomly kill their bomby Verdurous Gearhulk for 3 makes you feel good. Finally, you can declare blockers, and then sac before damage is dealt, so this little guy can stop 2 sources of damage in a single combat. Plus! If your opponent doesn’t have an early drop he can get in for 2 or 3 damage. So he’s good early, and good late, and asks only that you give him just 1 shiny red mana. That’s a pretty spicy gremlin. Otherwise in decks that care about energy (like most Kaladesh red decks) Harnessed Lightning is horrifying. At the very least it’s 3 damage for 2, and late game it could hurt much, much worse. It already looks pretty good, but it plays even better. 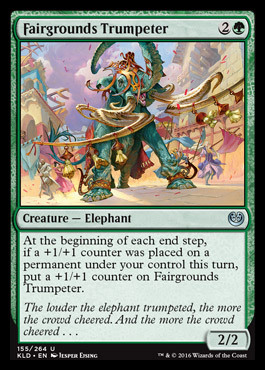 In green, one of the weird stand outs is Fairgrounds Trumpeter. It doesn’t look all that strong, but it’s a trick. 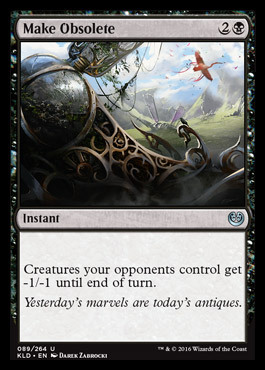 What it really says is “whenever a creature comes into play on your side, put a +1/+1 counter on it.” Kaladesh is filthy with +1/+1 counters, and many of the things in green and white at 4 mana or higher come in with counters on them. Or with things like Longtusk Cub, Fairgrounds Trumpeter will just keep getting bigger and bigger. Swinging with a 6/6 on turn 5 feels good for you and bad for them, which is nice. Honorable mentions also need to go out to Oviya Pashiri, Sage Lifecrafter who will single-handedly win the game if you leave it alone. 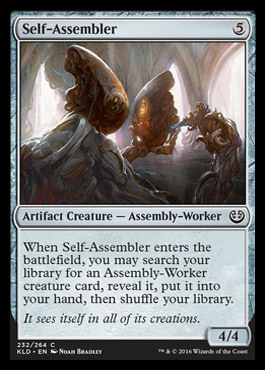 Next up is a sweet artifact that looks like it shouldn’t work, but manages to beat the odds through sheer numbers and believing in itself – Self-Assembler. A 4/4 for 5 isn’t great. You probably won’t cut it out of most decks, but nobody is going to open one and squeal in delight. But Self-Assembler will also go find another copy of itself (or honestly if you have some janky combo, anything with the type – “Self Assembler”). Then when you play that one you can do it again. It’s basically a 4/4 for 5 that draws you another 4/4 that does the same thing. Another way to think of it is like this: would you pay 15 for a 12/12 if you could do it installments? I know I would, because adding 12 power to the board is 100% bananas. Now before you get too excited, in a 40 card deck 3 is probably the most you want to play, since having 2 in your hand makes you feel bad. Also don’t forget that in the worst possible case they can crew most vehicles and drive them around. The Aradara Express for example. Maybe I like it because whenever I attack it reminds me of the last scene in North by Northwest. More likely is that an 8/6 with Menace is really hard to get rid of. Since it needs to be double blocked on account of the Menace you’re going to get a bunch of value, and your opponent really can’t just sit around and do nothing because taking 8 in teeth is a good way to lose games. Bonus points for how well it synergizes with Self-Assembler. Also, it’s a really good virtual blocker. Let me explain. Say you have 3 creatures, and I have the Aradara Express. If you attack with 1 of those creatures, and I kill one, you can’t stop the train anymore. So it encourages you to leave all 3 of your dudes at home, which means my train has stopped an attack without having to block or do anything else. Plus, it’s no slouch if it has to actually block either. If a train doesn’t do it for you, Skysovereign, Consul Flagship is a gods damned Visa because it’s everywhere you want to be. But you already knew that. That wraps our coverage of Kaladesh. If there’s something I missed, or you want to share how you too made a robot turducken, let us know in the comments. 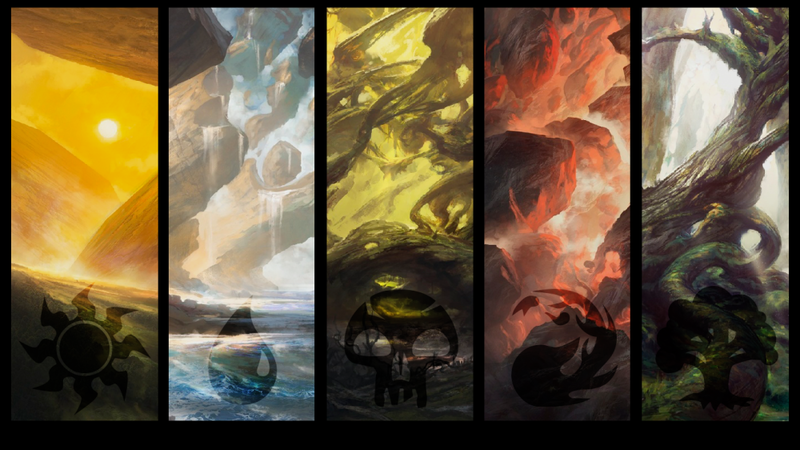 In a few short months we’ll be back to look at Aether Revolt – the next part of the Kaladesh block. 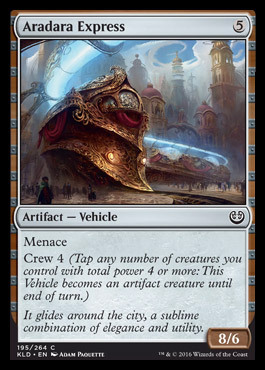 Until then, may you open a whole bunch of Kaladesh Inventions.